Part of China’s rapidly developing space program consists of testing new anti-space technologies, even though the country publicly pledges not to militarize space, the Pentagon said in a report to Congress. 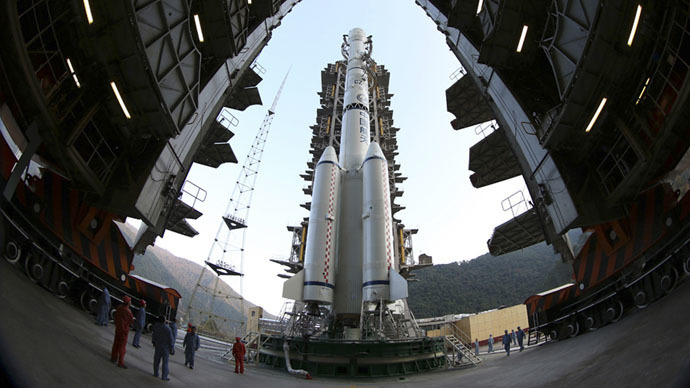 “By the end of October 2014, China had launched 16 spacecraft, either domestically or via a commercial space launch provider. These spacecraft mostly expanded China’s SATCOM and ISR capabilities, while a few others tested new space technologies,” said the report detailing potential threats from China, which the US DoD released Friday. Among the latest achievements by China the report mentions the first-ever launch of a satellite capable of sub-meter resolution imaging, the Chang’e-5 lunar mission and the completion of a new space launch facility on Hainan Island. While acquiring new space assets of its own, China is developing “a variety of capabilities designed to limit or prevent the use of space-based assets by adversaries during a crisis or conflict, including the development of directed-energy weapons and satellite jammers,” the report said. Of particular interest for the US military was the July 23, 2014 launch, which the Pentagon says was a follow-up of the 2007 destruction of an in-orbit defunct weather satellite. Another Chinese space mission in May 2013 sent an object on a ballistic trajectory peaking above 30,000 km. The trajectory was nearly high enough to reach geosynchronous orbit, in which many nations place communication and earth-sensing satellites. The report says the mission did not place anything into the orbit and was inconsistent with “with traditional space-launch vehicles, ballistic missiles or sounding rocket launches used for scientific research” pointing to a possible test of an anti-satellite weapon. Countering orbit access and taking out enemy satellites would be a big advantage in a conflict against an enemy armed with advanced precision weapons, like the US. China however denies developing counter-satellite technologies and pledges to keep weapons out of space. The US generals don’t seem to be convinced. “China’s continued development of destructive space technologies represented a threat to all peaceful space-faring nations,” the report said. Another emergent threat the report focuses on is China’s closer defense cooperation with Russia, particularly on the acquisition of advanced weapon technologies. “As Russia has come under pressure from sanctions imposed by the West over its actions in Ukraine, Russia is turning to China for investment to avert a recession and is now granting China access to advanced weapon systems that it once restricted,” the document said. “Russia’s concerns about intellectual property protections affect the types and quantities of advanced arms or associated production technologies it is willing to transfer to China, but resistance is waning as Russia looks to China to relieve the effects of Western sanctions,” it said. China is expected to become the first foreign country to buy S-400 surface-to-air missiles from Russia and is planning to purchase advanced Su-35 fighter jets. There were reports of an arms deal for an unnamed Russian anti-ship cruise missile on the table. The two countries are also expanding their joint military exercise program, with a first-ever naval drill in the Mediterranean coming this month.